NEW YORK (CNNMoney) -- Toyota is recalling 2.2 million vehicles to correct problems that can cause gas pedals to become stuck in floormats. In one problem, the gas pedal can get stuck in the plastic pad part of the driver's side floormat, if the floormat isn't replaced properly after it's removed, Toyota said in its announcement. The automaker is recalling 20,000 2006 and early 2007 model year Lexus GS300 and GS350 All-Wheel cars to fix this problem. In other cars, a retention clip used to secure a piece on the vehicle's center console can come loose and interfere with the gas pedal. 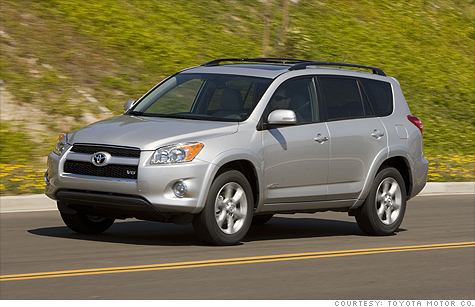 To fix that issue, Toyota is recalling 372,000 model year 2004 through early 2007 Lexus RX 330, RX 350 and RX 400h SUVs, as well as approximately 397,000 2004 through 2006 Highlander and Highlander Hybrid SUVs. Also, Toyota announced it is expanding a 2009 recall in which gas pedals could become trapped on extra-thick floormats that did not originally come with the car. Dealers will reshape the cars' gas pedals and floorboards so that they won't get stuck even when thick, all-weather floormats are used. Approximately 603,000 model year 2003 through 2009 Toyota 4Runner SUVs, approximately 17,000 model year 2008 through 2011 Lexus LX570 SUVS and approximately 761,000 model year 2006 through 2010 RAV4s are being added to that recall. The recalls come after a National Highway Traffic Safety Administration investigation to determine if Toyota's 2009 recall for pedal entrapment had gone far enough to cover all possible causes, NHTSA and Toyota said. "The National Highway Traffic Safety Administration reviewed more than 400,000 pages of Toyota documents to determine whether the scope of its recalls for pedal entrapment was sufficient," NHTSA administrator David Strickland said in a statement. "As a result of the agency's review, NHTSA asked Toyota to recall these additional vehicles, and now that the company has done so, our investigation is closed." NHTSA recently closed a separate 10-month investigation into whether electronics could have caused unintended acceleration in Toyotas, as some auto safety advocates had contended. Working with scientists from NASA, the agency concluded that electronics were not a factor. The report ultimately blamed three things: pedals becoming trapped on floormats, pedals that can become stuck because of age and wear, and driver error. Toyota's response to NHTSA's recall request -- promptly recalling nearly 2.2 million vehicles -- contrasts sharply with Ford's recent recall of 144,000 F-150 trucks after NHTSA requested the recall of 1.3 million. The responses reflect the different positions each automaker is in, said Scott Painter, chief executive of the automotive website Truecar.com. Given its recent history, Toyota had to respond strongly in the face of even the slightest question about safety. "What they're really trying to do is put this investigation to bed," said Painter. Ford, on the other hand, is riding a wave of public goodwill and, therefore, had more flexibility in its response. "Ford is doing what any automaker should do and saying 'Safety has to be balanced with reason,'" said Painter. In Ford's case, the carmaker elected to recall only those vehicles in which an airbag problem was most common. NHTSA is reviewing Ford's decision and could still demand a broader recall. Customers who want more information on the recalls can call Toyota customer service at 1-800-331-4331 or Lexus customer service at 1-800-25 LEXUS or 1-800-255-398.